Marco Silva has been named as the new manager of Everton, the Merseyside club announced on Thursday. Silva arrives at Goodison Park replacing Sam Allardyce, who departed at the end of the 2017-18 season. He has been without a job since the turn of the year after he was sacked by Watford as a result of plummeting form following an approach, made in November, by Everton as they wanted the Portuguese coach to replace Ronald Koeman. The 40-year-old was not granted permission to talk to Everton and the Blues would end up appointing Allardyce on an 18-month contract. 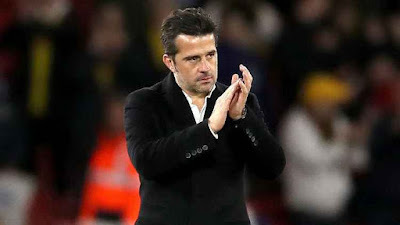 Silva's arrival is the latest major change at Everton as former PSV Eindhoven technical director Marcel Brands replaced Steve Walsh as director of football in May, while Professor Denise Barrett-Baxendale was named as the club's new CEO. "I'm really proud to be the new Everton manager," Silva told evertontv. "I'm excited and I'm really happy to take this big challenge for us as a club and for me as a manager. "I know the huge history of Everton as a club and what the fans expect. I'm sure with everybody working together I will be ready for this challenge. "We have a lot of work to do in this next month and it is important to prepare everything in the right way. But there will be even more important work to do from the start of pre-season into the first Premier League match of next season. "I know what our fans expect -- they expect results but not only results. I want our fans to be proud when they see our team on the pitch. I want them to feel that we are committed, that we are working hard and enjoying our football because that is important as well. "We want to build a great connection between the squad and the fans, and I'm sure that with our attitude and demands of commitment then our style of play will see that, I believe. "Everton is a really ambitious club and that is what I want. What we are seeing now are good changes at the Club. The Club is changing its approach. But one thing we cannot change and nobody wants to change is the huge history and ambition of the Club. "Everybody knows Everton's history. When you are a club like Everton, you only have one solution -- to aim to win. In football it is impossible to win every match but we must do everything to show in every game that we have ambition. That is what I want and I'm sure we will show that every single week."